In this episode: We filned this on 5/4/14 so...HEY....May the 4th be with you!;)... 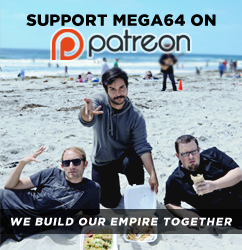 I'll give you a couple minutes to stop laughing....OK, in this podcast we mostly talk about our newest video: MEGA64 INFILTRATES NINTENDO (E3 2014 ANNOUNCEMENTS)! We talk about all the crazy stuff that went into making it and, what it was like at the Nintendo of America HQ. We also announce the dates for Gamedays 2014! That, and so much more! Listen to the audio here! That's all for now, before you go, we still have some ONSLAUGHT shirts available! You should totally get one!